I have a 3 year old black brushcoat Shar Pei named Bocephus. He started fevering at 4 months old & I was scared to death. My vet didn't know anything about FSF so he read about it online & suggested Colchicine. I was never a big fan of pharmaceutical drugs but more & more people were pushing it so I was guilted into giving it to Bocephus. That was until he had his worst fever ever while on it. I stopped giving it & searched online until someone referred me to the Yahoo Shar Pei groups. That is where I heard of Lita & her wonderful remedies. Here I am today, happily stating that Bocephus has been fever free for over a year now while on Lita's remedies & other natural supplements. Thank you so much, Lita! You're truly a blessing to this breed! all..She was acting like her normal self..
for any I knew that was not the case.. I told my vet I was bringing Lita on the case and she was all for it...I sent Lita the labs [no one can read labs like Lita] and she found what she felt was a blood infection, put together some remedies and told me to get a couple supplements...In no time Emmie was in fine shape. I find that pei with FSF do far better on Lita's remedies as well less kidney failure for sure..4 different Pei in my family with FSF over time. At 2 years old, our Romeo had his 3rd and worst fever episode. 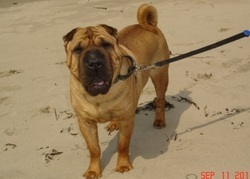 He's the 3rd Sharpei we've had that has fevered, and this was the worst I'd seen. His whole head, not just his muzzle, swelled up like a watermelon, and his hocks were so painful he couldn't even walk. It was on a holiday weekend and we had to drive him several miles to a vet who could see him, who, incidentally, had never heard of FSF. After pain meds and fluids we took him home and gave him ice baths several times during the night before he was even able to rest. He was a very sick little boy. We were afraid we'd lose him. Romeo is 6 years old, and has had only a couple extremely mild and short-lived fevers since. We are never without Lita's Bone and Pain, and Infection pge2. urinalysis and told me, among other things, that I should consider sending our boy to a university vet center to have him studied, that he had very thick blood and his kidney numbers weren't good. I called Lita instead. I know who has my boy's best interest at heart! After studying the lab results, she sent me a vaccination remedy and a renal remedy. (I feel so stupid to say that I didn't even put together the fact that he had a rabies vaccine just less that 2 weeks before the seizure episode). She also wisely suggested that raw and home-cooked feeding, instead of commercial dog food, along with appropriate supplements, might greatly enhance his health and life. Now I only go to the pet store for the occasional grain free cookie or a new leash for all the walks we take! In fact, the clerk said she thought I must have moved away when she saw me recently. We now have ourselves a happy and healthy 6 year old boy who has yet to show signs of slowing down. His lab numbers have continued to improve. And I have Lita to thank for all this wonderful news. Bless her, she loves these animals. And, as long as a pet parent is able to do his/her part, Lita will help you save your animal from suffering and give them a happy life.